This new set is created using the Alchemy font. I have distressed the lettering, giving it a grunge feel. There are fourteen in this new set, the image on the left has been created by using these. 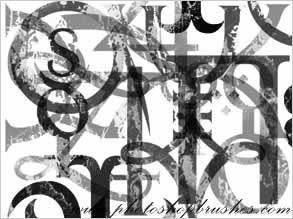 There are more Font Brushes which can be found here, with a selection of different font characters. There are loads more Grunge Brushes available on my site if you want to add that dirty grunge look to your artwork.